Barring a large volcanic eruption or a very sudden return to La Niña or negative AMO conditions which could temporarily cool climate, ten year global average warming ratesare likely to return to late 20th century levels within the next two years. Abbildung 1: PDO-Verlauf der letzten 115 Jahre. Aus Scaife et al. 2015. Dabei handelt das Met Office jedoch kurzsichtig. Denn der volle Zyklus der PDO beträgt 60 Jahre, nicht 10. 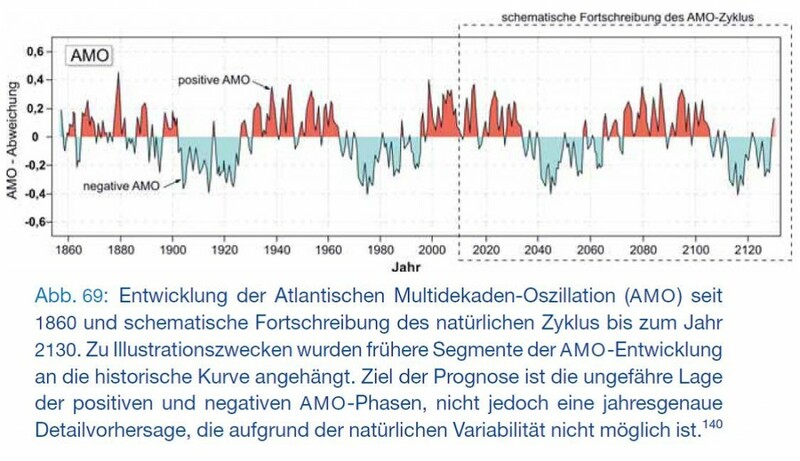 Der kürzliche Aufschwung der PDO wird nicht von langer Dauer sein und der Ozeanzyklus schon bald wieder ins Negative stürzen (Abildung 2). 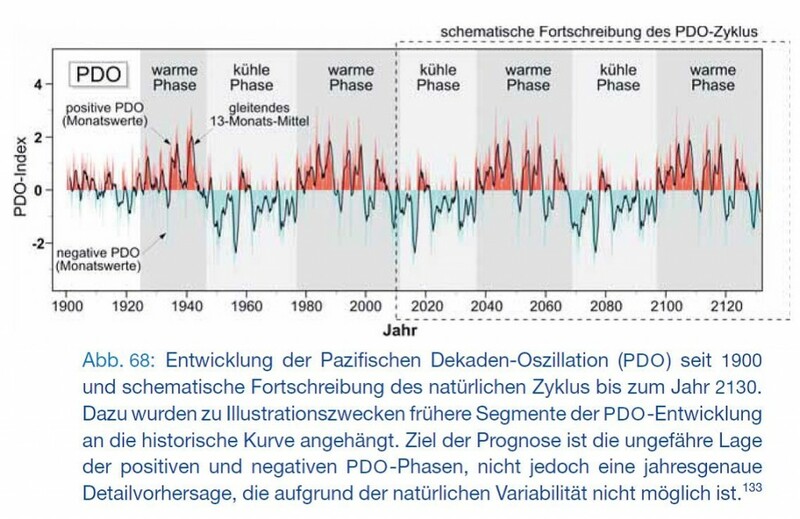 Wie bereits aus der Met Office-Graphik hervorgeht, dauerte die kühle PDO-Phase 1945-1975 ebenfalls 30 Jahre. Hochfrequente Zwischenspitzen wie die aktuelle haben daher keine klimatische Langfrist-Signifikanz. Despite these signals it is not certain that there will be a shift towards cooler Atlantic conditions over the next few years. Temporary cooling has occurred in the past without leading to a sustained AMO shift. However, the current trends suggest that the chances of a shift in the next few years have increased. […] The current warm phase is now 20 years long and historical precedent suggests a return to relatively cool conditions could occur within a few years (Knight et al., 2005). However, the short observational record precludes a confident prediction based on observations alone. […] Observational (Folland et al. 2013) and model (Knight et al. 2005) estimates further suggest AMO shifts have an effect on global mean near-surface temperatures of about 0.1 ̊C. A rapid AMO decline could therefore maintain the current slowdown in global warming longer than would otherwise be the case. We use surface air temperature to evaluate the decadal forecast skill of the fully coupled Max Planck Institut Earth System Model (MPI-ESM) initialized using only surface wind stress applied to the ocean component of the model (Modini: Model initialization by partially coupled spin-up). Our analysis shows that the greenhouse gas forcing alone results in a significant forecast skill on the 2–5 and 6–9 year range even for uninitialized hindcasts. For the first forecast year, the forecast skill of Modini is generally comparable with previous initialization procedures applied to MPI-ESM. But only Modini is able to generate a significant skill (correlation) in the tropical Pacific for a 2–5 year (and to a lesser extent for a 6–9 year) hindcast. Modini is also better able to capture the observed hiatus in global warming in hindcast mode than the other methods. Finally, we present forecasts for 2015 and the average of years 2016–2019 and 2020–2024, predicting an end to the hiatus. Given the importance of the PDO for influencing global mean surface air temperature [Kosaka and Xie, 2013; England et al., 2014], it is no surprise that our forecast suggests that the current hiatus in the rise of global mean surface air temperature will come to an end, leading to accelerated warming compared to the past decade. Indeed, according to our prediction, the global mean temperature from 2016 to 2019 (2020–2024) will be 0.35K (0.28K) warmer than the 2–5 (6–9) year forecast mean for the 1990–2006 FFY hindcasts. In der Referenzperiode 1990-2006 stecken noch 0,2°C Erwärmung von 1990-1997 drin. Nach 1998 ist es nicht mehr wärmer geworden. Ziehen wir diese 0,2°C ab, so lautet also die Prognose vereinfacht: In der Phase 2016-2019 soll es 0,15°C wärmer sein als das heutige Temperaturplateau, während es danach offenbar wieder leicht kälter werden soll: Der Temperaturdurchschnitt 2020-2024 soll unterhalb desjenigen von 2016-2019 liegen. Dies wäre 2024 ein knappes Zehntelgrad über dem heutigen Temperaturplateau, also nur die Hälfte der vom IPCC prognostizierten Erwärmungsrate von 0,2°C pro Jahrzehnt. Es scheint als sei die vorhergesagte Erwärmung in den kommenden 3 Jahren von der bereits erwähnten PDO-Spitze befeuert. Wenn diese Spitze dann kurz darauf abbricht (Wetter, nicht Klima! ), setzen wieder kühlende PDO-Bedingungen ein. Ist dies die Idee? The Galápagos is a flourishing yet fragile ecosystem whose health is particularly sensitive to regional and global climate variations. The distribution of several species, including the Galápagos Penguin, is intimately tied to upwelling of cold, nutrient-rich water along the western shores of the archipelago. Here we show, using reliable, high-resolution sea surface temperature observations, that the Galápagos cold pool has been intensifying and expanding northward since 1982. The linear cooling trend of 0.8°C/33 yr is likely the result of long-term changes in equatorial ocean circulation previously identified. Moreover, the northward expansion of the cold pool is dynamically consistent with a slackening of the cross-equatorial component of the regional trade winds—leading to an equatorward shift of the mean position of the Equatorial Undercurrent. The implied change in strength and distribution of upwelling has important implications for ongoing and future conservation measures in the Galápagos.